Follows God’s pattern of work for six days and rest for one. As people made in God’s image, this is the way we are designed to function. Frees others from the burden of work. When we give ourselves permission to stop and rest, we give that permission to those around us, too. Frees us from the prideful thought that the world will fall apart if we stop working. A Sabbath reminds us that God holds the world together. We can rest because He provides. Lets us experience grace – God loves us for who we are, not what we do. God delights in us when we accomplish nothing. Our minds, souls, and bodies need rest. Scientific studies actually show that we function better and are more productive when we take a day of rest each week. The following are suggestions you might try that will help you to “pray and play” on your Sabbath! Give yourself permission to relax when mess and work still remain! Set it aside; it will be there to pick up tomorrow. Be especially attuned to the people with you. Engage in honest conversation without distraction. If you must work on Sundays, find another 24-hour period. 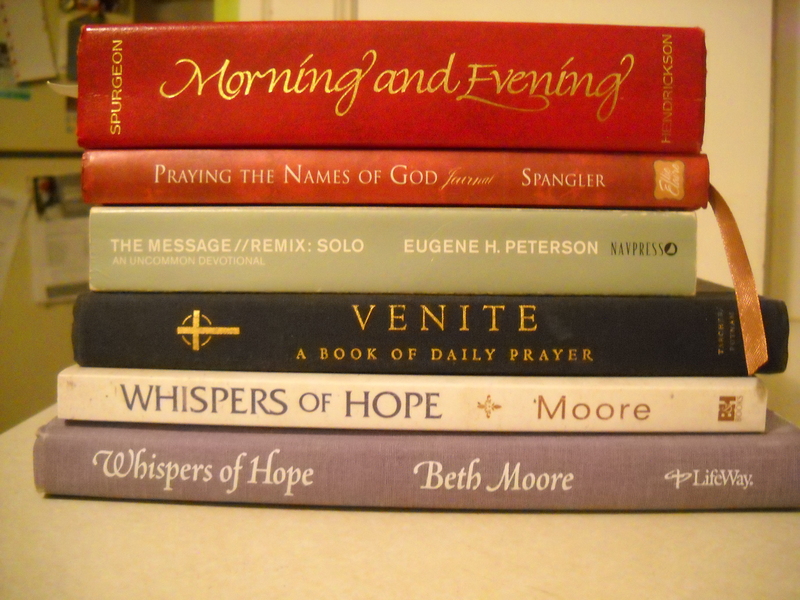 Two stacks of devotionals I have enjoyed over the years or currently. From classics to prayer books to scripture books to lectio divina. I hope you will find one that draws you near. Morning and Evening-the beloved classic devotional with readings for day and evening as the title suggests. Praying the Names of God Journal-Ann Spangler focuses on one name of God over 3 days with room to journal and write out your own prayers. The Message//Remix: Solo-This devotional works its way through the entire Bible through selected passages using lectio divina (sacred or divine reading). Using scripture reading, meditation and prayer as the focus of your time with the Lord. This technique is a wonderful way to zoom into scripture from a different vantage point. Venite: A Book of Daily Prayer-this is a wonderful book to help one pray the hours. It is now out of print but if you can find a used copy, you have found a treasure. Whispers of Hope-I bought the lavender copy in 2005 at a Beth Moore conference in Spokane, Washington. Unbeknownst to me, my friend, her sister and I all bought this devotional without knowing it. Each day, begins with a reading, a reflection and then space to journal in 5 areas of prayers. I was so disappointed when I finished this devotional. Then it went out of print. Just a few weeks ago, I found it reprinted. I wish it was the original size but this one is more portable. Daily Light-I love this little book of scriptures for morning and evening. Each day is arranged with a common theme. I love its portability too. I have given this many times for gifts. Jesus Calling-another book I have given as gifts, like boxes of them. I started reading this devotional before the big craze. The book came out in 2004. I think I started reading it in 2006. It was kind of a toss up. I bought a copy and also a copy of Dear Jesus. I didn’t know which one to keep and which one to give as a gift. I gave Dear Jesus to my then pastor’s wife as it seemed more like a gift book. Who know? If you haven’t heard of it, each day has a few verses and a few paragraphs written as if Jesus has written it just for you. I like to think of it as marching orders. A Diary of Private Prayer-a skinny book of prayers with room to write as well. Classic. My Utmost for His Highest-another classic with a key verse and reflections from Oswald Chambers. If you are not interested in living solely for Christ, don’t bother. Each day, I am reminded of what a heart pounding for Jesus should look like. 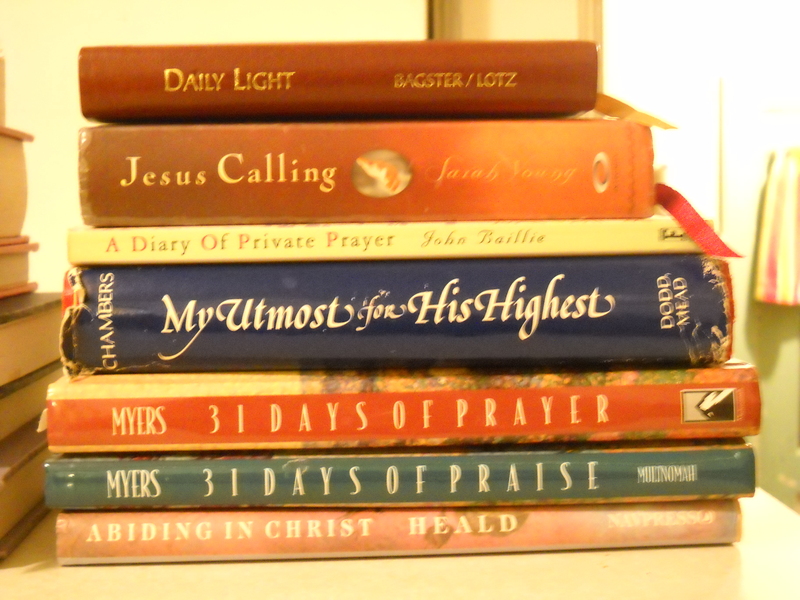 31 Days of Prayer and Praise-How I have marked these books up. Ruth Meyers teaches you day by day how to pray the scriptures. Abiding In Christ-a 30-day book focused on abiding in Christ. I revisit this little book every couple of years. If I knew the source I would give credit where it is due. S-is there a sin to avoid? P-is there a promise from God to claim? E-is there an example for me to follow? C-is there a command for me to obey? K-how can this passage increase my knowledge about God or Christ? Have I looked up words I don’t understand to discover the range of possible meanings? Have I asked who, what, where, when, why, how and wherefore? Have I identified any OT quotes and checked their context? Have I used a Bible dictionary to identify and read parallel passages? Have I double checked my personal interpretation with reliable commentaries? Have I asked what this passage tells me about God, myself and others? Any commands to be obeyed? Print these questions and tuck them into your Bible for quick reference. Love this! Just printing a copy. Thank you.